This information is intended merely to give you a starting point for running an event. Once you create an event you will have access to detailed instructions and useful tips of how to successfully conduct an event. Being an Event Administrator is a big responsibility. If you've never done it before you're in luck because InteliScout can save you incredible amounts of time and anguish that you would otherwise have to suffer. If you've run large events before then you already know how much time, effort, and even abuse you must endure to produce a successful event. You, we believe, will be the most thrilled with everything InteliScout can do for you as an Event Administrator. After 15 years of running and hosting countless large and small events, we may not have seen it all, but we've probably come pretty close. As a result, we've continually improved our system to cope with everything from family emergencies on event day to losing half your classrooms the night before. We may not solve these problems for you, but we do provide the information you need when you need it to make split second decisions and calm the angry mob. To create your new event click the button on your council event page that appears after you're logged into InteliScout using your personal account. This will take you to a form requesting basic information about your event. When you click the button your event will be created and you will be sent back to your council event page where your event will appear. Simply click your new event's name so see your site's initial front page. When you create your event you will be asked for provide an admin ID and a password for your event. These are necessary to log into your event as an administrator. It is suggested that you change either or both the admin ID and password once you log into your event site the first time. When you first create your event you simply need to click the event's name in your council events page. 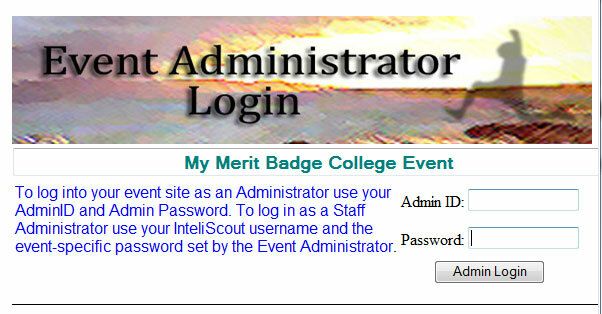 In the future, you will first need to log into InteliScout using your personal InteliScout user ID and password. In either case, the name of your event will appear in the list of events for your home council. Clicking your event name will take you to your event's initial front page. Your front page can be expanded and customized. Directions on how to do this will be accessible once you log in as an administrator. Note that when you first create an event the default front page displays an Under Construction message and registration for your event is disabled as indicated in the event summary on the right. Clicking the Administrator Login link will open the Event Administrator Login window. Enter the Admin ID and Password that you used when creating your event. 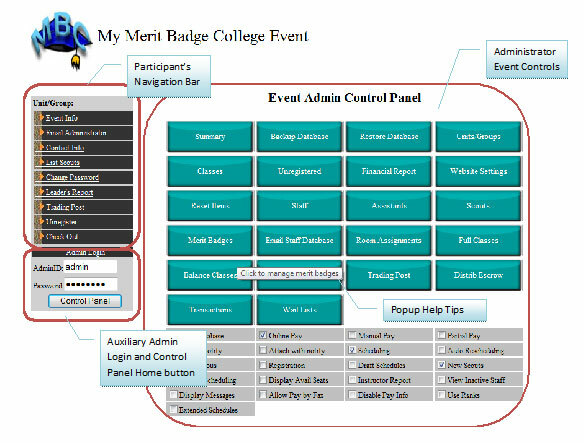 When you click the Admin Login button you will be logged into your event as an administrator. Once logged into your site as an administrator you will be presented with the Event Admin Control Panel which allows you to completely manage all aspects of your event. See Event Administration Features for a discussion of many of the features InteliScout provides to the Event Administrator. When event fees are paid by participants online InteliScout holds the fees in escrow until requested by the Event Administrator. The Distribute Funds button on the Admin Control Panel sends a request for distribution of escrowed funds paid online. The Financial Report button on the Admin Control Panel displays a report of all online as well as manually entered fee transactions. Online transactions are tagged with a transaction ID generated by the bank involved in the process. Manual transactions can be entered by the Event Administrator and a note applied such as a check number, etc. Funds are released in one of two ways. First, they can be transferred without charge to any Wells Fargo account. Second, a check is electronically generated and mailed to the designated recipient. Once the funds are released you will receive an email with two attachments. The first attachment is a full accounting of all transactions whose funds are being released including unique transaction ID that can be used to trace the transaction back to its origins. The second attachment is a confirmation of the transfer of funds or generation of the check. Important note: Generating a check to release escrowed funds may take up to 5 business days. Important note: For events that support groups of participants with a single event registration, there is no transaction record kept of payment for individual group members, only for the group as a whole. Important note: The banking fees incurred by InteliScout while processing online transactions will be subtracted from the distribution amount at a rate of 6.25%. This will be indicated on your distribution report. Inteliscout reserves the right to update this percentage. If the "No Bank Fees" checkbox in the Admin Control Panel is NOT checked these fees are added to the participant's payment at checkout. In either case, it is the event's responsibility to cover these banking fees. 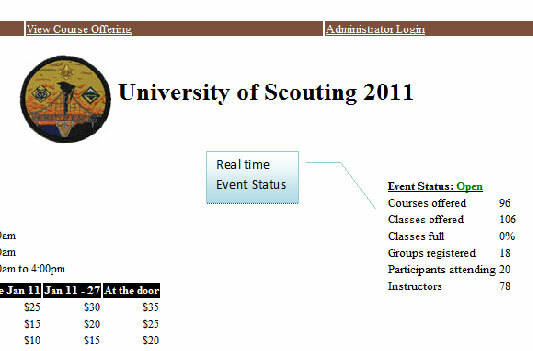 InteliScout keeps a record of all fees paid within the event database. The list of all transactions for your event can be accessed by clicking the Transactions button on the Admin Control Panel. From the Transactions View you can see all existing transactions, whether automatically generated by an online payment, or manually entered. To record a manually received transaction simply click the Add button. Once you have created an event and logged into it as the administrator, a link will appear for the Administrator's Guide. This guide will describe every feature available to you as an Event Administrator as well as tips for running a successful event. We also offer a guided tour of how to manage your event with InteliScout. To schedule an online guided tour send us an email at support@inteliscout.com and we'll do our best to schedule an online 30 minute walkthrough. Finally, if you have any questions feel free to send them to support@inteliscout.com. It seems that every district and every council have their own nuances for managing certain events. While InteliScout can't possibly anticipate them all, we believe we've reached a good balance between intuitive ease-of-use and flexible power. So, if there's something you want to do but just can't figure it out, send us an email at support@inteliscout.com and we'll try to give you some tips. If that doesn't work, then we'll consider adding any new feature that would make our system better. Closing out an event is important because it triggers the distribution of any remaining escrowed event funds (see Online Fee Disbursements) and also removes the event from your council's active event list. This is easily done with a by clicking the Close Out Event button on the Administrator Control Panel when logged into your event as an administrator. There are many tools available to the Event Administrator designed to give you the ability to run the event as you see fit while providing active or passive access to information related to the event. When you log into an event site as an administrator you are presented with an Admin Control Panel that gives you access to all of the features below. The Event Administrator decides what information should be presented to prospective participants when deciding whether to register for your event. This is done through a simple interface that works much like Microsoft Word or similar word processing programs. From this browser interface you can change fonts, text color, text size, insert links to other web pages or to documents with important information to be downloaded. 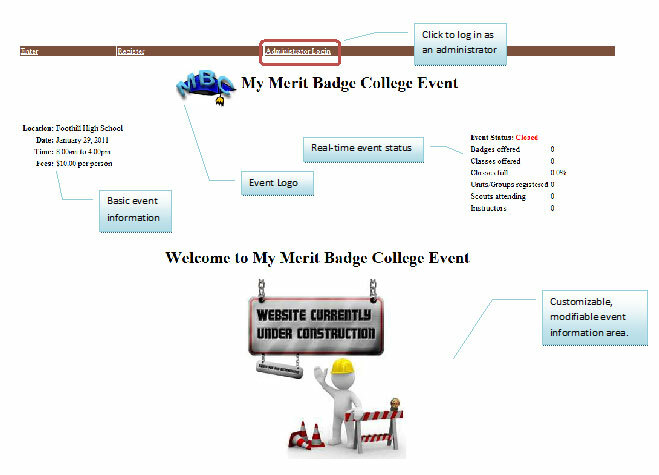 The image below shows you the interface used to create your Event Front Page. The Front Page of your event can be changed at any time. It is often useful to change this page once online registration is closed. 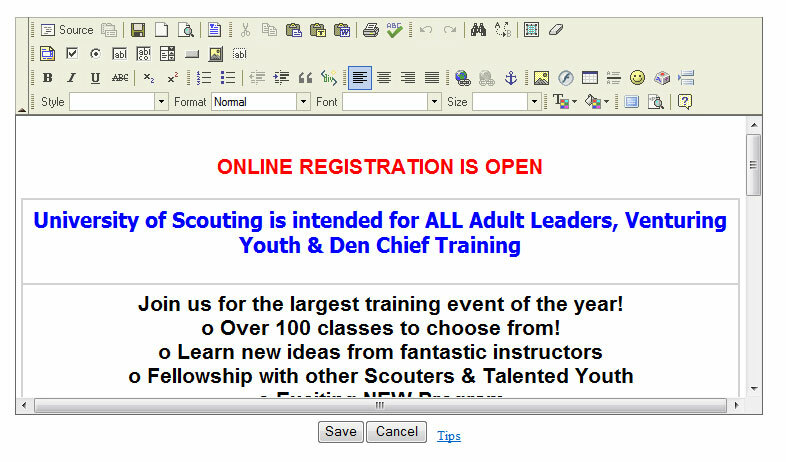 The image below shows a portion of an Event Front Page generated by InteliScout. Every Event Front Page includes an auto generated Real Time Event Status that presents useful information all who visit your Event Front Page. It is particularly useful to view the Event Status and the percentage of classes full as this could reduce procrastination for those putting off registration until the last minute. When someone registers for your event for the first time they are shown the Welcome Page. The interface used to create this page is the same as that used for the Event Front Page. Typically, a special welcome message with instructions to the new registrant is presented in this page. Like the Event Front Page, links to pictures, websites and documents can also be inserted into the Welcome Page. The Welcome page is modified using the same interface as the Event Front Page. Each time a registered person enters your event's site a popup window may be displayed with up-to-date information or directions. The interface for this page is the same as for the Event Front Page and the Welcome Page. As the Event Administrator you have the ability to disable this popup window. The Event Administrator enters the start and end time of each session for events that require them. All classes are then assigned one or more sessions for scheduling purposes. 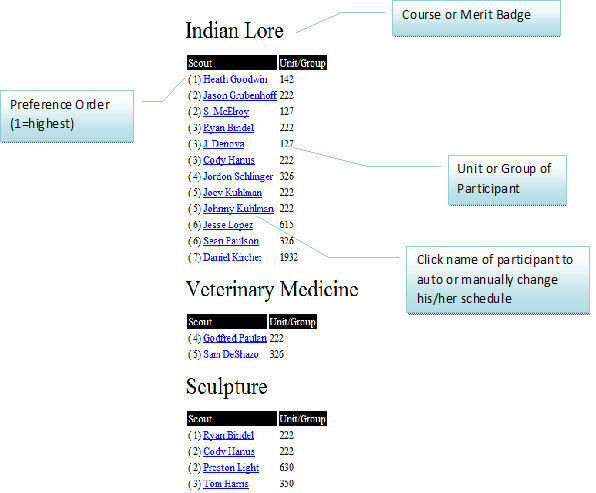 A Group or Unit view of your event shows you all registered units including unit name, contact person information, number of group members or scouts, fees due, last date and time they logged into the site, and whether the members/scouts have been scheduled. From this view the Event Administrator can log in as though he/she were the group/unit leader to help diagnose any problems they may be having. The Event Administrator can also send an email to a group/unit leader. It often falls on the shoulders of the Event Administrator to correct problems related to a particular scout or participant. For this, a Participant/Scout view is provided to allow you to quickly find the participant or scout and investigate the problem. From this view you can manually place the scout or participant in any class you choose. This is particularly helpful for special case, last minute or "at the door" registration. For many large events, managing the staff year after year is crucial to providing a quality program. For this reason, InteliScout allows Event Administrators to retain class, contact information, and general notes about an instructor of staff member in the InteliScout database. Staff members can be active or inactive and inactive staff members can be retained in the database while being filtered out in the Staff view to retain the information while reducing the clutter. For some very large events, deans may be set up to manage the huge task of recruiting, contacting, informing large number of staff members in a given area. For this, Event Administrators can identify a staff member as a Staff Administrator. This allows a Staff Administrator to log into the event site as an administrator but with limited capabilities. Staff Administrators can manage staff, assistants, make sure blue cards are completed, email staff members, etc. Staff Administrators cannot access anything related to scheduling, information presented to participants, fees, or any other highly sensitive information. Assistants can be managed just like Staff members since, with luck, assistants will be future instructors or other important staff members. So, managing assistants can be a very important part of providing a quality program year after year. Events can either be anonymous or by invitation only. This decision is important since some events simply cannot handle opening themselves up to the general scouting public, or have special requirements like a commitment to provide some number of instructors. By invitation only events require that the Event Administrator create Groups/Units in advance and give the Group/Unit name and password to the appropriate contact person. Using this information, the contact person can log into the event and begin managing his/her group or unit. Anonymous events allow anyone who is an InteliScout user to create a Group/Unit for your event and create their own password allowing them to log into your site, add members/scouts, pay fees, etc. It is strongly suggested that any restrictions you intend to place on attendees for your event be clearly stated in the Event Front Page anytime you put on an anonymous event. When an individual, group or unit leader selects which courses or merit badges he/she would like they can be automatically scheduled and presented with the results immediately. This is preferred method of scheduling since it gives preference in a first-come-first-served basis. Conflicts are automatically resolved by the system based in the priority of the preferences of the courses selected for each student. Optionally, auto scheduling can be disabled and the entire event can be scheduled under control of the Event Administrator. The difficulty in this method is the time it takes to notify those participants that did not make it into their preferred classes, make new selections, then attempt to reschedule again. Another form of scheduling, Manual Scheduling, can optionally be enabled by the Event Administrator. If this feature is enabled then the unit/group leader can manually place a student into specific classes in specific sessions. This feature is not recommended other than for last minute changes as it often causes problems such as a unit or group taking over an entire class, effectively blocking out everyone else. Typically, Manual Scheduling is only enabled for brief periods allowing one or more group or unit leaders to rectify problems that were not of their own making. A data entry error by the Event Administrator is a common example of this. Draft schedules are a tool for the Event Administrator to allow participants to schedule classes when instructors and final class locations are still in flux. When draft schedules are enabled the schedules printed by participants have a draft watermark and a notice that their schedule may change. It is advisable to leave draft schedules enabled until everything is settled just before your event. Then, disable draft schedules and send an email to all participants requesting that they print their final schedules. Below is a sample draft schedule followed by the same schedule with Draft Schedules disabled. Waiting lists are a powerful way for an Event Administrator to make adjustments as the event date approaches. Participants are placed on the waiting list when they requested a course or merit badge but were not scheduled in an associate class because of a scheduling conflict or because all classes are full. By looking at the preferences of the participant on the waiting list it is easy for an Event Administrator to make changes while draft schedules are enabled. This information is critical to increasing class sizes, or even adding entirely new classes in order to put more participants into their preferred classes. Many events will offer the same class in several sessions, often with different instructors. In order even out class sizes for each of the sessions the Event Administrator may elect to balance classes. It is suggested that classes be balanced while Draft Schedules are enabled. As the day of the event approaches it is often useful to know which classes are full so that class sizes may possibly be increased or new classes added. This view is available to Event Administrators for easy access. A Financial Report for your event can be generated at any time. This report provides all the information necessary to reconcile both online and manually entered payments. The Trading Post is a great way to support multiple types of registration fees, sell patches, hats, T-shirts, mugs, etc. The Event Administrator has the ability to list the items for sale, the number of items in stock, the price, and even upload a photo of the item if desired. Each item in the trading post can have an activate and deactivate date and time. Using this mechanism you can set up automatic late fees and event disable registration altogether by having all registration items expire on the moment you want to close online registration. Below is an example of three types of registration, Adult, Venturing Youth and Boy Scout. Each type of registration has a different price if paid before January 18th when the price goes up by $5 until online registration closes on January 26th. Once all registration items have expired registration is disabled and no new registrants are allowed. The Real Time Event Status of the Event Front Page will show a status of Closed. If all registration items in the Trading Post are pending then the status summary will show a status of Pending. If at least one registration item is currently active then the status will be shown as Open. Rapidly shifting and last minute changes to room assignments is a nightmare for many events. When you show up the morning of the event only to find out that a class of college students will be occupying a room you have dozens of scouts scheduled in, what do you do (besides panic?) InteliScout gives the Event Administrator a matrix view of used and available rooms by session so you can quickly shuffle room assignments. It also allows you to reassign rooms to classes, check for collisions, and tell you which participants need to reprint their schedules to get correct room assignments. Collecting fees is always a contentious matter for most Event Administrators. There is always the odd case of "the council lost my registration," or "I mailed it, it's your fault it got lost." To address these cases InteliScout allows payment to be made online using credit or debit cards by individuals registering themselves, or group/unit leaders. When paid online, your event database is automatically updated for you. A full accounting of all online transactions is provided and funds are transferred to a specified bank account, or a check is sent, when requested. Funds may be transferred any number of times prior to an event or requested in one lump sum once the event is closed out. Not all councils support online payment of funds. In this case InteliScout provides a form to the user that is printed and mailed to the designated address with a check for the fees. The Event Administrator will need to be notified that payment has been received and manually enter the payment in the event database to keep it updated. The Transactions button on the Admin Control Panel will list all transactions received thus far, whether online or manually entered. You can also add new manual transactions to create a complete, track able, financial report. A full Financial Report can be generated by clicking the Financial Report button on the Admin Control Panel. Event Administrators can optionally receive automated emails each time someone registers for their event or pays online. This allows you to passively monitor what is happening without having to log into the event site yourself. InteliScout performs nightly backup of event databases. However, you can backup and restore a database yourself as an Event Administrator. This is useful when you are attempting something new and do not wish to accidentally delete or change anything in an active database. You can also lock an event database preventing anyone from logging in an modifying anything while you are performing some task. Pinewood Derby is a special event, though the concepts are very similar to those presented above for Merit Badge College/University. For Pinewood Derby, scouts register for Racing Divisions that are appropriate to their rank (e.g. Webelos 1, Webelos 2, etc.) For this reason it is important that the rank of each scout be entered. For each race within a division, you will need to specify the rank of scouts allowed to participate. Within a Racing Division there may be any number of races. Each race has a unique name and is attached to a Racing Division. Once a scout's division is entered he can then be scheduled at which time he is placed into a race for each division he has chosen.